Can you forgive everyone that’s ever hurt you, including yourself? 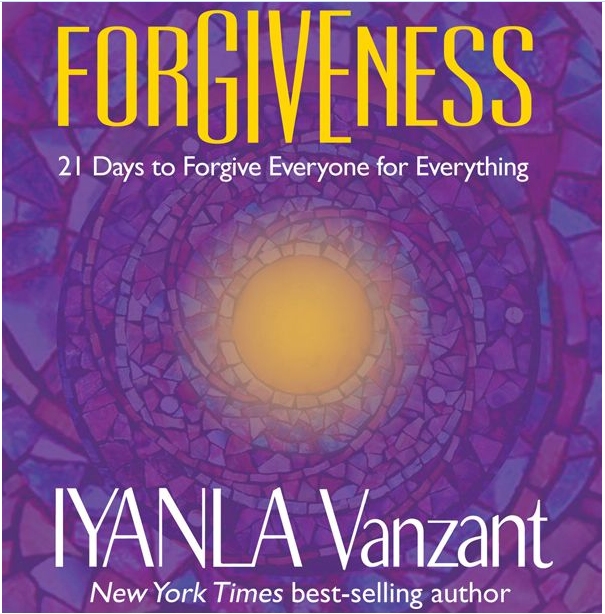 With Iyanla Vanzant’s help in her new book, Forgiveness: 21 Days to Forgive Everyone for Everything, I was able to recognize emotions I thought had been long ago dealt with, and deal with them as I traveled the forgiveness journey with her. Spiritual life coach Iyanla Vanzant takes you headfirst, soul deep into the practice of forgiving yourself, your body, your life, your parents, your choices, your relationship with money, and more… no stone or grudge is left unearthed. What is the benefit of following Iyanla’s forgiveness protocols in this book? Practicing forgiveness, as she demonstrates, helps you keep your energy clear and manifest what you truly want… living your life with more love for yourself and others. Through the journaling pages and EFT (Emotional Freedom Technique) tapping instructions in the book, and the soothing meditations in the accompanying CD, you are given the tools to eliminate any excess mental or emotional weight that keeps you stuck in repetitive situations, circumstances and experiences that are not healthy or productive. You can simply read this book for its wonderful insights and interesting “Forgiveness Stories” in each chapter. Or you can take it one day at a time with Iyanla and spend 21 days following her system of total forgiveness. It’s work, but it’s worth it. As she says, “Forgiveness helps to transform and eliminate the energy blockages that we hold in our minds about who we are and who others are, and the subsequent issues or upsets that grow from the thoughts, beliefs and judgments we hold.” If found the part on letting go of judgments to be very powerful, as they create needless suffering. Day 1 in the Forgiveness Ritual is “Forgiving Myself for Judging Myself,” the most self-loving, self-affirming practice you can do, opening the heart, mind and spirit to greater possibilities. Once you reach Day 18 and “Forgive the World,” you spend the last three days of the program writing forgiveness letters that you never send, because acknowledging your emotions and writing them is what is important. Once completed, forgiveness will be a new tool in your skill set to live your life to the fullest. The book was meant to be in my hands!